As you may know, ever since 1999 I've celebrated the new year with a two second long exposure that documents what I was doing in the last second of one year and the first second of the next. I have met these with varying degrees of enthusiasm. (You can find them by going back to the Jan 1 entries for my blog posts and then back to the Photo A Week archive starting in 2000). Anyway, this year trillian_stars and I had to do a photo shoot for a Top Sekrit play that she's going to be in -- so I figured our 2 second photo could be during that and it would be a little ambitious trying to make them all work together, but Trillian didn't want to wear her costume all night (it's this frumpy nightgown) so we shot it at around 10:00 and then I worked on photoshopping the poster and I stopped upstairs about 3 minutes to midnight and Trillian hadn't changed. "I thought you wanted to wear something festive," I said. "I did," she said, "I'm too lazy." "I just want to go to sleep," I said. "Welcome to dullsville, population us," she replied. 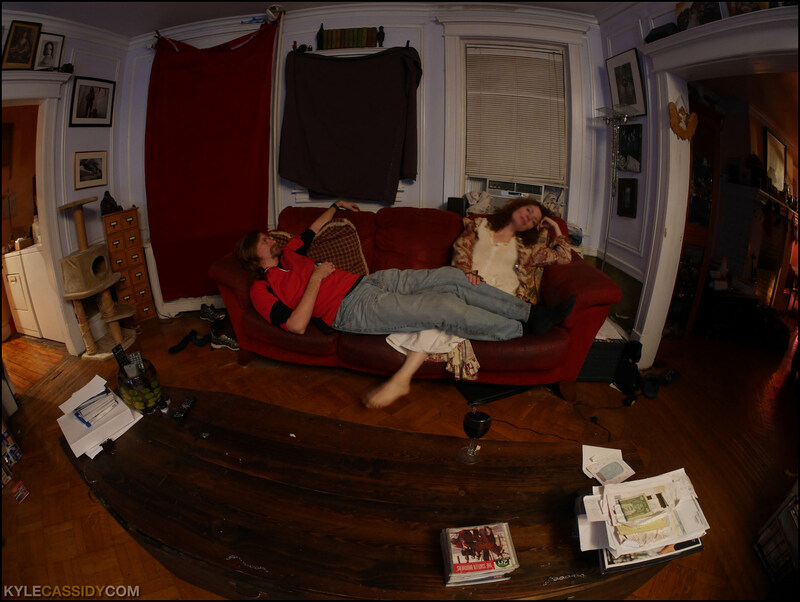 At 11 seconds to midnight I hit the self timer and laid down on the sofa. At midnight the neighbors screamed and shot off bottle rockets. This is our exciting world. Clickenzee to remember the last second of 2015! The fireworks started here around 9:00 and continued until about dawn when I heard a cop car pull into the culdesac north of me and switch on the bullhorn: "This is the police. People are trying to sleep, so stop with the explosions or I'll have to start arresting all of you." Most of my neighbors are from south of the border so they brought fireworks back after their Christmas trips. This is actually an improvement, as the drugrunners that used to live here are all in prison now, so no more "machine guns at midnight." There were plenty of mortar-fired aerial flashbangs over the next building, though.... Loud enough to get your attention, but that's all. Happy to report that nothing came in the window this year, after last year's incident when two teenagers started making a game of trying to shoot bottle rockets through my window... That didn't end well. hey you! so good to hear from you!! You two. I love it. This actually looks divine. Snuggling on the couch with the love of your life, feeling snuggly and accomplished-- nothing to complain about there. Mazel Tov! We in Hot Breakfast-landia played two gigs... an early show in West Chester, and then a 10:30-1am show at a private house concert in DE, of a well-known musician/philanthropist. (I say "house concert" - but his basement is a venue, complete with dance floor that's bigger than my house, concert lighting, a sound system and a sound booth, rock memorabilia everywhere (he has Boots Randolph's sax on display!)... it was really something. We had the honor of jamming with some rock legends: the horn section from The Blues Brothers / Dave Letterman / Springsteen / Paul McCartney. We're so honored to know so many wonderful and generous connectors, and are even more honored that these connectors deem us worthy of connecting to others. We love returning the favor. It's never about competition; it's about spreading the awesome. Thanks for being one of those precious connectors for so many people, Kyle (us included). Happy New Year to you and Trillian. Not sure how 2015 can be topped, but I have no doubt it's already in the works! I opened LD just to make sure you'd done this again. I have a friend over four the holiday, and as I opened my computer, I said, "I have this friend who posts in his LJ, every year, a two-second exposure over the New Year." I feel like my year can properly begin, now. Looks like the perfect start to the new year.